Lord and lady Tottering have taken up residence at THE HOSTE in Burnham Market, in Norfolk. 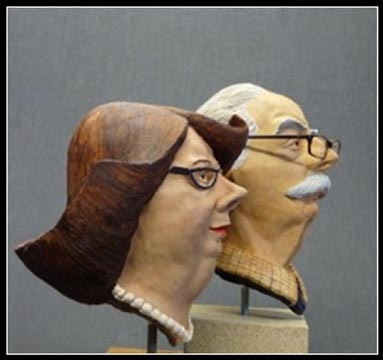 Annie has unveiled two specially created busts for THE HOSTE of Dicky and Daffy to mark the occasion. In 1997 THE HOSTE commissioned Annie to produce an original painting of the bar featuring Dicky and Daffy and the then owner, the late Paul Whittome, along with other locals who frequented the bar at the time. This painting has now been re-hung alongside over FIFTY cartoon prints featuring the residents of Tottering Hall in the official TOTTERING BAR at THE HOSTE. A visit is definately recommended for a 5-star welcome at this very popular establishment. 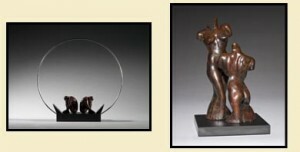 Annie has created a new gallery at her home in Stibbard, Norfolk. Her gallery is now open to the public for private viewings by appointment ONLY. The gallery houses her original Tottering-by-Gently drawings, prints and books and also her wonderful display of beautifully tactile sculptures that Annie has now embarked on.